Serve fresh and to perfection! 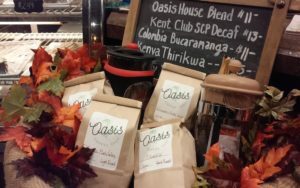 The coffee supplier for The Oasis is Ferris Coffee of Grand Rapids, Michigan. The crew members at Ferris are amazing, cutting-edge, artisan roasters. They know how to make great-tasting coffee and are always trying to get even better. We had been going to the retail shop at Ferris for a few years and had begun building a relationship with them when we realized the obvious question: why aren’t we doing business together?! The Ferris team has been a great help to us while sharing their passion for coffee and the people who grow, roast, brew, and consume it. Drip Brew Method is the most common method for brewing in the United States. 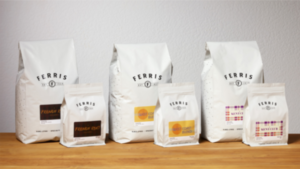 First we take some of our freshly ground Ferris coffee then pour it into our Bunn coffee brewer where hot water is poured through the ground coffee beans, extracting all the wonderful flavors. Cold-Brew Method is a brewing method in which ground coffee is soaked in a proportionally small amount of cold water for approximately 24 hours. The grounds are strained out resulting in a concentrated coffee. The cold water method produces a full-bodied cup with low acidity. Espresso is basically a dark-roasted blend. To brew the espresso we finely grind the 1924 espresso blend from Ferris. We then take the ground espresso and dose it into the portafilter and tamp it. Then we extract the espresso with a certain amount of time and pressure depending on the order. French Press Method. We take coarsely ground coffee beans and pour them into a French Press pot and then pour hot water on top. We then let the coffee steep for 3-4 minutes. Then we press down the filter to separate the grounds from the coffee (hence French “Press”). Coffee is 99% water – that’s a big percent! So, at The Oasis, we make sure to use only properly filtered water. Regular tap water has minerals and chemicals that can negatively effect the taste of the coffee – which is not good. The water that we use to brew our coffee goes through a 5-part filtration system. The water is first run through a basic water softener to remove some of the heavy metals and chemicals. After that the water is put through a particle filter to get rid of any nasty little particles that may have gotten in. Then, the water goes through a dechlorination process, because you really don’t want chlorine-flavored coffee. The water is next run through a reverse osmosis process to completely remove the rest of the minerals and chemicals. Then finally the water is run through a re-mineralization process to put back certain minerals that actually help the coffee taste better. Another factor of water that plays a big role in the taste of coffee is water temperature. If the water isn’t hot enough when brewing the coffee will be weak. If the water is too hot, the coffee will be bitter.